Blanquette went and sparkled its way right into Thomas Jefferson’s Monticello, and into the palace of the Czars in St Petersburg. 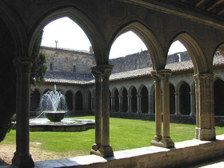 And it sparkles still, in that small, relatively unknown high-quality appellation in the foothills of the Pyrenees, where to this day, it is made in the shade of that same monastery where it was first discovered, mostly from mauzac (up to 10% chardonnay/chenin allowed). The name Blanquette is in the ancient tongue (langue) of Oc (d'Oc) (Langue + d'Oc = Languedoc) called Occitan, and means 'little white one'. 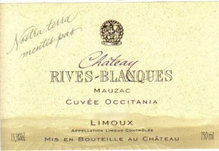 It refers to the white down on the underside of the mauzac leaves, but actually chimes in quite nicely with our own name, Rives-Blanques ('white banks' in Occitan). Speaking for ourselves and on behalf of our own Blanquette, it is a very clean, fresh, easy to drink sparkling wine with a lift of summery floral acidity, brut but less aggressively so than most champagnes - Steven Spurrier called it a 'lovely champagne substitute' in Decanter ... though some of us could easily justify calling champagne a lovely Blanquette substitute. And just for the record: it's the oldest appellation in the South of France (and in fact one of the oldest in France altogether); it has the lowest permitted maximum yield of any sparkling wine in the country (and that includes the C-word); and it is all entirely harvested by hand. End of story? Not quite. When mauzac doesn't sparkle, it goes flat - or at least that was the perceived wisdom. It is actually very difficult to vinify into an interesting still wine, which is the challenge that spurred on the team at Rives-Blanques. So we put aside our best field of un-cloned 30 year old mauzac vines, cut down the yield, urged them on into super-maturity and tried to make something new and exciting out of this old, traditional and basically forgotten grape variety. The result is our Cuvée Occitania (label, at right), gently fermented and aged in seasoned oak barrels and the only 100% mauzac wine in the world with an appellation label. It even speaks in Occitan - the langue d'Oc - and says on the label "Nostra Terra Mentis Pas" ..., which means 'our soil tells no lies'. Exactly. But is it any good? It's fabulous. Tom Stevenson's wonderful wine reference book, Sotheby's Wine Encyclopedia, has just come down heavily in favour of Cuvée Occitania. So too the august La Revue du Vin de France, which lists it amongst France's best wines of the year, every year. Decanter even gave it a nice little medal, and it's on the wine-list of half a dozen Michelin-starred restaurants... but try selling it. In commercial terms, ‘Occitania’ is the most unsuccessful success we've ever had - in any language. So spurred on by this great non-success, we thought we’d take it to new heights: a late harvest hopefully-botrytised mauzac. We've done a pretty good job with chenin, so why not mauzac? A mauzac called Xaxa, to celebrate the 21st birthday of the daughter of the house. That was in 2004, a relatively wet, coolish sort of summer. The hectare set aside for Xaxa's wine refused to budge, and the weather started playing funny games with us. October became November, November turned into December. By the time we harvested in mid-January 2005, in freezing weather and just days before a big snowfall, we were already down on record as the latest late-harvest in living memory in the Aude valley. If anything needs hand selling, it will be the mauzac called Xaxa, but we're not quite there yet because it's still in the barrel. Note the operative word 'barrel'. That's all we got. From one whole hectare of vines, one single barrel's worth of brix and kicks. So place your orders now because there isn't enough to go around. I hope the tradition of fantastically bad puns for titles continues with future guest bloggers. Kudos! Are your wines available in Washington State? Do you have a distributor? I'd love to see them here so I can drink them. I love this this wine so much. I will buy a bottle the next time that my friends arrive to my house. It's fine to drink a very good beverage among friends. Thanks. There are many grape varieties but I think that the best is Mauzac because it is an old traditional variety and it is of the Renaissance so imagine that quality, I want to taste a wine with that grape variety. Wow… excellent Hmm… I must say you have a good knowledge on the subject that you write. I have been noticing that after reading all your articles. They are crystal clear and just good. Who cannot read and understand such an article. Simple yet great! Today is a beautiful day, very warm greetings to all readers of this blog, regarding this article I would like to add that I found very creative, some time ago I tried to blog and the result was not very good, apart this I believe that the information is also cool. In general, congratulations to all who are related to the creation of this article.